A painter, illustrator and designer, Carr was born in Chicago, Illinois, lived NYC and painted in rural Georgia. He was best known for a series of paintings of rural Georgia life done around Tallapoosa, GA where he moved in 1891. These works were considered to be the sole successor to that time of Eastman Johnson’s and Winslow Homer’s Southern genre paintings. He also traveled to Mexico and did a number of paintings of the Spanish-American War in Cuba in 1896. He studied with Lefebvre and Boulanger at the Academie Julian, Paris and exhibited at the National Academy of Design, Boston Art Club, Pennsylvania Academy of the Fine Arts, St. Louis Expo and Art Institute of Chicago. 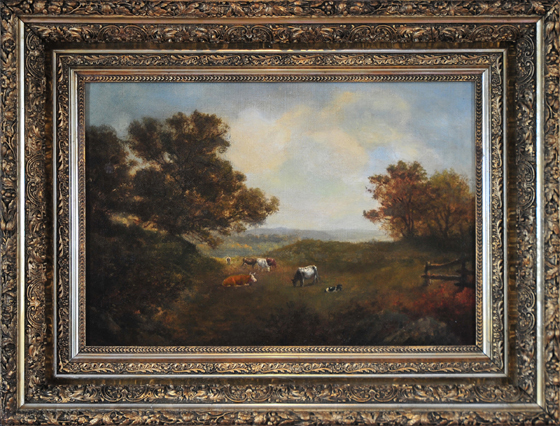 Comments This painting is in excellent condition in a period frame, also in excellent condition.